Throughout most of the first forty minutes or so, up to the point of the band’s signing with Alan McGee’s Creation Records, the same thought kept pinballing around my head, like Liam kicking a soccer ball rather awkwardly outside a Welsh barn converted into a studio: “Why do they have footage of some of these moments?” As much as the Gallaghers perpetuate the idea that they always knew they would be famous, seeing moments like both sides of a phone call which ostensibly shows Noel learning about Liam’s formation of a band from their mother, Peggy, and the Glasgow gig where McGee discovered Oasis and signed them after hearing four songs makes you wonder if they really did know all along, and if their time on the dole was just filler for the requisite rags to riches rock star narrative. But then, really, why even bother with the spectacular, drawn-out demise of a band most reasonable people stopped caring about twenty years ago anyway? The reason greatest hits collections sell is because they contain what people want, and the Gallaghers understand that as well as anybody. To focus on the years leading up to and surrounding Definitely Maybe and (What’s the Story) Morning Glory?, while self-gratifying, does what this movie likely set out to do in the first place: recreate the feeling of an earth-shattering, colossal musical force the likes of which, as Noel notes, we are unlikely to see again in the digital age, at least as far as traditionally rock-driven groups go. As always, there are barbs between the antagonistic protagonists, with Noel largely falling back on “the music” as an antidote to any of the world’s ills; he repeatedly suggests that it was “the music” and “the people,” rather than anything he or Liam actually did, which made Oasis what it was, despite, you know, having written the music that Oasis played. While some may find the animations and transitions for places when footage isn’t available distracting, they can be entertainingly magnifying, as is the case when the brothers detail their sides of an infamous mishap on a ferry bound for Amsterdam in 1994. Again, reading the reviews, one largely knows what to expect already. Anyone relatively familiar with the rise of Oasis can chart many of the themes here, but the gems of Supersonic lie in its previously unseen or publicly unavailable footage. Unseen, the Gallaghers – that is, Noel, Liam, Peggy and their oldest brother Paul, as well as band members and ancillary figures in the Oasis tale – give some background to archival footage as well. Overall, what the viewer gets out of Supersonic depends factors intrinsic to any documentary: how much one knows, and cares, about the subject, and what one wants out of it. As a movie, it’s enjoyable enough, and positively raucous at times, even if not entirely necessary or definitive. 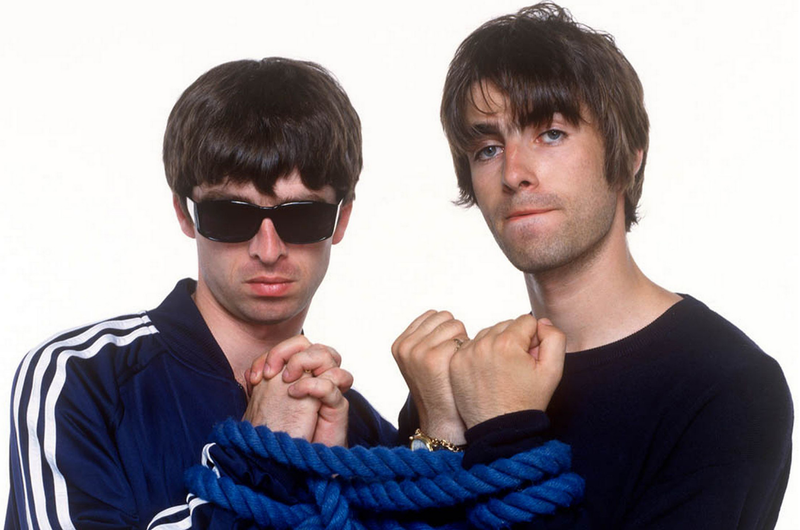 “Every time we had a scene in Oasis,” Noel says at one point, “Whenever we’d get back together, it was like nothing ever happened.” If, as is widely speculated, Oasis does indeed reform in the wake of this and the unnecessarily sprawling Be Here Now boxset, one can assume there will be as much noise and confusion as always. For reference, however, should you ever come across either Noel or Liam, it would behoove you to avoid following topics: their father Tom; Tony McCarroll, the band’s original drummer; Manchester United; the combination of champagne, Jack Daniel’s and West Ham United fans that incited an incident on an Amsterdam-bound ferry in 1994; and the Arctic Monkeys. Also, as important a question as any: how many people in Mancunian suburbs had video cameras and were just mindlessly taping anything? 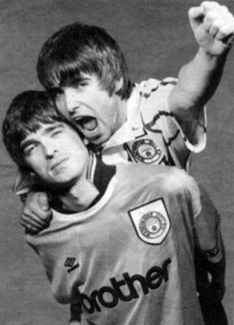 Liam seen wearing a Beatles shirt, a few Stone Roses chords as backdrop, etc. Though, Tony McCarroll’s revenge via a lawsuit serves as a nice bit of schadenfreude for anyone who looks to hate-watch this, or, I suppose, get clearer context than that available on Wikipedia. Again, interesting that Supersonic completely glosses over everything from 1997 onward parallel to an overblown reissue of this particular album, often noted itself as the overblown signal post for Britpop’s collapse.